Sensi #1318 CBD (Harlequin x Black Domina) – strong relaxation with reliably high levels of CBD from multiple breeding lines. SENSI #1318 CBD Harlequin x Black Domina is the result of a challenging breeding program in which we combined one of the strongest CBD varieties from the USA with one of the strongest Afghani strains from the Sensi Seed Bank. Harlequin is a standout variety in terms of reliable CBD levels, and a cerebral, pleasantly alert high with the relaxing effects of the indica powerhouse which is Black Domina. This award-winning strain brings all the elements of a powerful Afghani to the table: a short flowering time, a compact bud structure, a pungent flavour and a strong body high. The result of this cross is a relaxing, balanced hybrid with a 1:1 THC to CBD ratio. Its complex flavour mixes the Black Domina’s pungent and earthy undertones with the Harlequin’s woody and flowery notes. Sensi #1318 CBD is a is a feminized strain, which will only produce plants that flower as females.. The Sensi #1318 CBD is a Sativa / Indica Hybrid. Sensi #1318 CBD will need an average flowering time to reach their full potential. Sensi #1318 CBD will have average height gain during flowering. Sensi #1318 CBD can produce an outrageous amount of weed, but may require a little extra attention. Sensi #1318 CBD can be grown outside in a normal warm summer. Sensi #1318 CBD Seeds is added to your shoppingcart! 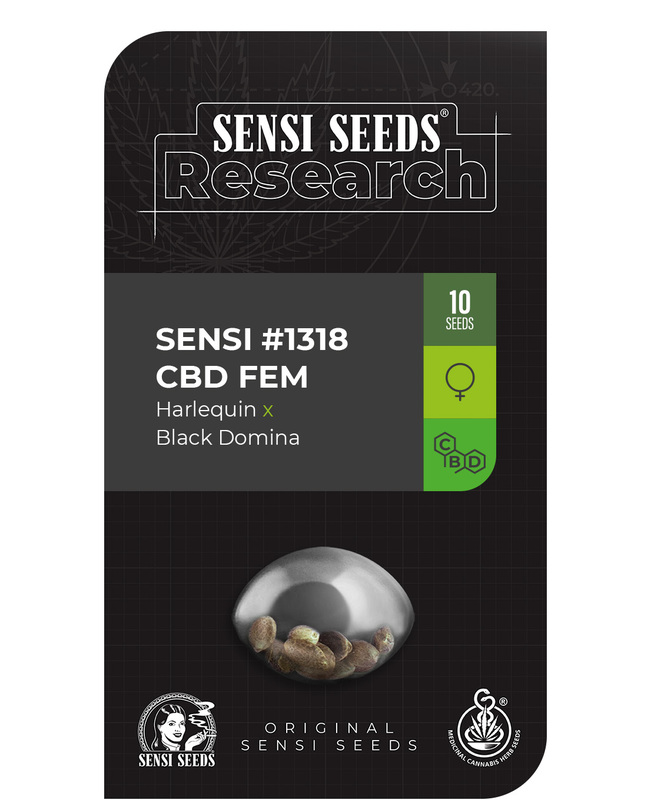 Sensi #1318 CBD Seeds is added to your wishlist!